The Shearstown Estuary wetlands is jointly managed by the towns of Bay Roberts and Spaniard’s Bay. The towns jointly won the 2009 Torngat Municipal Achievement Award in the category of Environmental Sustainability. Baccalieu Consulting has worked with the Joint Management committee of the two towns to develop materials about the wetlands project. The members of the Joint Management committee are Cathy Kleinwort (chair) and Councillor Mose Anthony representing Spaniard’s Bay, and Pat George and Councillor Bill Seymour representing Bay Roberts. The audience for materials that have been developed include residents of the two neighbouring towns, as well as people across the province of Newfoundland and Labrador and through the Internet, people all over the world. Even though the Shearstown Estuary has been allotted space on both the Town of Bay Roberts website and the Town of Spaniard’s Bay website, the Joint Management Committee wanted website of their own. After discussion, we concluded that a WordPress blog was the best solution for them. We have uploaded a large number of photos which we have taken of the Sheartown Estuary in various seasons on Baccalieu Consulting’s Flickr site. 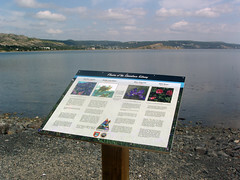 We have developed 10 signs that have been placed in the estuary describing life forms in the estuary. The signs include 6 about birds of the estuary which had information about the bald eagle, the osprey, the common loon, the American black duck, the dark-eyed junco, the blue jay, the northern pintail, the green-winged teal, the greater yellow-legs, the black-bellied plover, the common golden-eye, and the black-headed gull. In addition, there is one sign about flowers, one about grasses, one about invertebrates, and one about fish. All signs have been uploaded to Scribd. The sign which describes four of the flowers in the estuary is linked below, and the others can be easily found. We have also prepared two YouTube presentations about the estuary.